Pope Francis: Good For The Jews? Home / Latest / Pope Francis: Good For The Jews? Pope Francis’s visit to the United States has been met largely with adulation from both Catholic and non-Catholic or even entirely secular spectators. During his papacy thus far, the Western media have seemed to respond warmly to the native Argentinian during his papacy, especially in comparison to many of his predecessors. 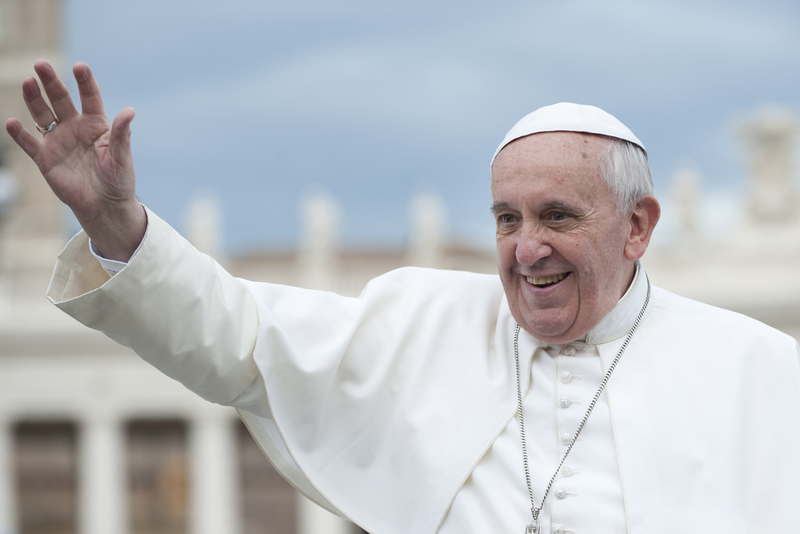 The Jewish community has also responded generally positively to Pope Francis. Even prior to becoming Pope, Jorge Mario Bergoglio frequently stressed his intentions to mend broken ties in Jewish-Catholic relations. He and close friend Argentinian Rabbi Abraham Skorka wrote Sobre el cielo y la tierra (On Heaven and Earth), a collaborative effort to encapsulate their many conversations concerning theological issues in the 21st century. In it, both stress the importance of maintaining interfaith talks in order to solve challenges of hatred or ignorance. Moment spoke with Rabbi David Rosen, the International Director of Interreligious Affairs of the American Jewish Committee, about his perception of the Pope and what he hopes to see from him in the future. When you last spoke about Pope Francis, you said that you were impressed by his efforts to bridge the divide between Jews and the church. Do you think he’s lived up to that commitment? Well, if I remember correctly, I was speaking about not only what he’s doing but also what he’s done in the past. I don’t think he’s done anything enormous since his papacy. There are a couple of things that are notable. One was his first encyclical; he devoted a large part of that to his relationship with the Jews. Perhaps the most important thing is that he spoke of the importance of an engagement with the living Jewish community today. In other words, it’s not only the roots of the past, it’s a matter of the relationship with the Jewish people in the contemporary context. Of course there have been other statements—for example, that you can’t be a Christian and an anti-Semite, or that anti-Semitism is a sin. Those are all things that his predecessor said. But today, [public] images are created much more instantaneously than ever before and once the media have a certain image, it’s very difficult to be able to persuade it that the image is wrong. So when the Western media had a certain image of Benedict XVI, it didn’t matter what he did, he was almost always taking a negative route. With Pope Francis we have almost the reverse situation: Almost everything he does is seen positively, and whatever the Western secular media or society doesn’t like, they ignore. Which is great for the Catholic Church and is actually great for the Catholic-Jewish relationship because it relies on the fact that Pope Francis is so remarkably, and I would say often quite irrationally, popular in the world at large. And everybody knows that he is a genuine friend of the Jewish people, and that, of course, is the difference between him and his predecessors. His friendships go back such a long way, and were so personal when he lived in Buenos Aires. You said that there are unfavorable things that the Western media ignore. Could you expand on that a bit? Very many things, for example, there has never been a pope in modern times who has spoken more about the devil and who has described the devil more as a living reality than Pope Francis. The Western media hardly give that any coverage at all. On the issues of abortion his opinions are no different from that of his predecessors. But when Pope Francis gives a presentation on the position of the church on abortion to explain why it is wrong but then turns around and says, “Who am I to judge?” then the attention has been overwhelmingly and quite excitingly on “Who am I to judge?” and none on his lecture on the official teachings of the church on abortion. How do you think that his reiteration of support fpr Jewish-Christian relations has affected your job in communicating with other religions? I actually don’t think it has had any effect on my abilities to be more effective or less effective in terms of global interface relations. It has had an effect to a significant degree on my ability to be able to persuade my own colleagues, especially within Jewish orthodoxy, that a relationship with the Catholic Church is in the interest of the Jewish people as well as in terms of our responsibility to our world. I think that there is more openness to seeing the Catholic Church in a positive light within Jewish orthodoxy thanks to this general image that Pope Francis has. I wanted to talk to you about the Pope’s interpretation of the secularization of the world. Do you think that secularization has affected the Jewish community at all? In all honesty, no. What we think of in terms of his social gospel, his criticism, started with John Paul II and continued with Benedict XVI. But under Pope Francis it acquired an attention way beyond anything it had before. But I don’t think it had any any significant Jewish reaction. But Jews are like anyone else: the more socially engaged, liberal Jews are delighted that the Pope takes these positions and that he has given visibility. The more conservative and reactionary elements within our community think he is a delusionary do-gooder who simply doesn’t live in the real world. You don’t seem to be the biggest fan of this pope. Am I misinterpreting? No, no, I’m a great fan. I think he is terrific! I think that the Western perception of him is very selective and very lacking context in historical memory and it’s very fascinating. In fact, when he was Cardinal in Buenos Aires he was not at all considered charismatic. There were nicknames for him that sort of called him grumpy face, but now he’s the biggest media star in the world. I’m a little bit—cynical is too strong of a word. I’m a little bit amused by this global adulation, but I say again that it’s very good for Jewish people and Catholic-Jewish relations. This reflection is totally to our advantage. Is there anything you hope the Pope says or does during his visit to the United States? I would say one of the disappointments is that the Pope’s visit to Israel was much briefer than his predecessors. And I would say it’s a shame that while he is in the United States, where you have the largest Jewish Diaspora community, that there will be no specific conversation within the community, only some in one interfaith event. I think that’s a pity. But again if he were to use the opportunity to acknowledge the special relationship between the Catholic Church and the Jewish people—which his predecessors have described as intrinsic to the very character of the Catholic Church, and to restate what he has said before about the special indebtedness of Christianity to its Jewish roots, that would be very, very significant and probably would be far more important than a photo-op with prominent Jewish leaders.